Climbing Plants delivered to your door. The key to success when planting a climber is to make sure that the soil is in good condition and the roots are away from the dry conditions found at the base of a wall. After planting, it's also good to cover the soil with a mulch to prevent competition from weeds and help retain all available moisture around the roots of the plants. Container-grown climbers can be planted at any time of the year, except when the soil is frozen or waterlogged. Autumn is the ideal time for deciduous climbers because the soil is still warm enough to encourage some root growth before the onset of winter. This helps the climber establish quickly so that it is able to withstand any hot, dry spells the following summer. Container-grown evergreen climbers can also be planted in autumn, but in exposed gardens they're best planted in April (May in colder areas). Top Tip: protect all vulnerable climbers over winter by covering them with a warm layer, like fleece. 1. Make sure there is suitable support for the climber - like trellis. If planting against a wall or fence make a planting hole about 45cm away from the base to avoid the dry soil found in these areas. 2. Dig a hole at least twice as wide and slightly deeper than the climbers container. Mix the soil you've removed with well-rotted organic manure such as Rootmaster and leave it to one side. 3. Nearly all climbers should be planted at the same depth as in the pot. Check the hole is the right depth by laying a cane or piece of straight timber across the hole. If the climber is standing too high you'll need to remove some of the soil in the bottom of the hole, or if it's too low, then top it up a bit. 4. Water the climber thoroughly and allow to drain. Gently tip the plant on its side and with one hand on top of the compost and around the climber to support it, ease the climber out of its pot. 5. Carefully pull out any roots that are circling around the bottom or sides of the pot, so they grow away from the rootball and into the surrounding soil. Position the climber in the centre of the hole and lean it back towards the bottom of the support at a 45 degree angle. Then fill in the gaps around the sides of the plant with soil mixture, firming it down gently as you go. 6. Once the hole has been filled, gently firm the soil once more - to get rid of any air pockets and make sure the plant is secure. Water the climber again using at least one full watering can. Then cover the soil with a generous layer of mulch, such as chipped bark to help prevent weeds and reduce the amount of water loss from the soil. Actinidia deliciosa Jenny is a self-fertile female kiwi fruit plant meaning it will produce edible fruits without the need for a male plant. 'Jenny' is a good fruiting variety with pale yellow flowers and lush foliage which add to the appeal of this fruit. A climber. Heart-shaped leaves. cup-shaped white flowers followed by edible. hairy. brown fruits. Large, rich cerise coloured flowers that continue to bloom freely over a long season. Ideal Conditions: Prefers partial shade with free-draining soil or compost. Possible Situation: Lovely compact habit - ideal for pots and containers on the patio or veranda. An early. large-flowered climber with green leaves. single mauve flowers with a red bar with red anthers. May also flower again in late summer. Good plant for a north wall. Height 2-3m. Spread 1m. Flowers from May to June. Deciduous. Hardy. 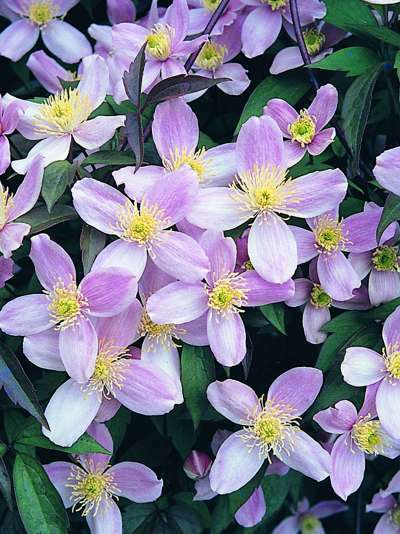 Clematis 'Arabella' bears its small, mauve-purple blooms with with creamy-yellow anthers from early summer to early autumn. 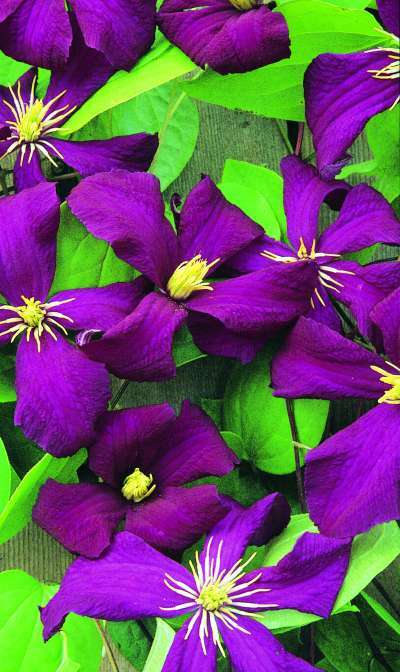 This is one of the longest non-stop flowering Clematis, giving colour from May to October. 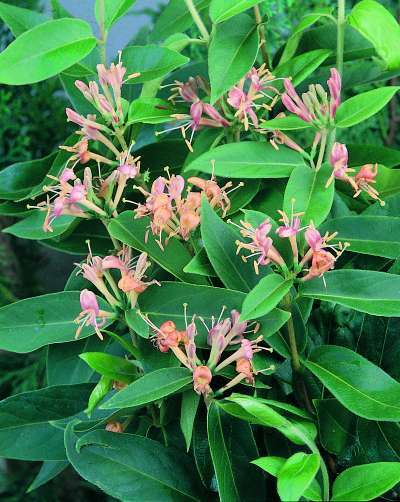 Part of the integrifolia group, this scrambling variety is semi-herbaceous with non clinging stems which are ideal for romping among mature shrubs, or cascading over banks and walls. This versatile perennial has a relatively compact habit making it useful for creating vigorous, weed suppressing ground cover, or spilling from large patio pots. Height: 2m (6'). Spread: 1m (3'). 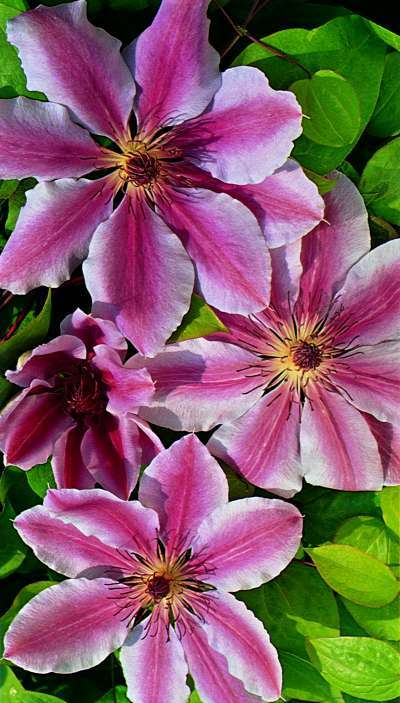 One of the most floriferous and rapid growing clematis varieties. Rubens is a pinkish form of the usual white Clematis montana. All forms are vigorous rambling climbers, with twining stems that produce a mass of scented flowers in May and June. May also produce a second smaller flush of blooms in late summer. From mid-summer to early autumn, it's covered with rich red flowers with pale pink undersides. Its compact nature makes it an excellent choice for container growing, and well as at the front of the border. A viticella clematis, Clematis 'Madame Julia Correvon' shows good resistance to clematis wilt. For best results grow in moist but well-drained soil. As with all the late-flowering clematis, pruning is easy: simply cut stems back to the lowest pair of buds in February or March. Climbing Hydrangea. A climbing shrub with dark green leaves turning yellow in autumn and domed clusters of white flowers in summer. Height 15m. Spread 3m. . Flowers from July to August. Deciduous.Hardy. Shelter from cold drying winds. Climbing Hydrangea. Vigorous. woody. deciduous climber. clinging by aerial roots. Ovate. dark green rounded leaves fading to yellow in the autumn. In summer bears domed corymbs of white flowers. Height up to 15m. Great for a shady or sunny wall. Winter Jasmine. A slender shrub with arching stems and clusters of fragrant. bright yellow flowers produced before the leaves in winter and early spring. Height 3m. Spread 3m. Flowers from May to September. Deciduous.Hardy. Late Dutch Honeysuckle. 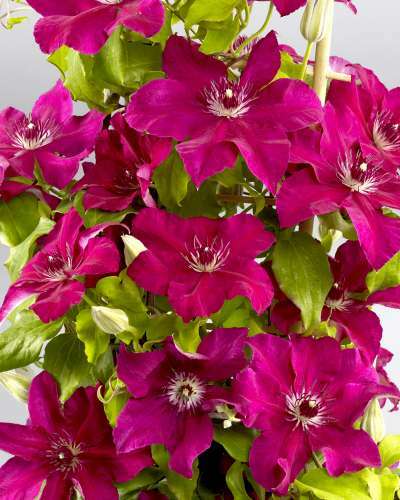 A twining climber with mid-green leaves and very fragrant creamy white flowers streaked dark purple-red. Height 7m. Flowers from May to June. Fruits from July Deciduous. Hardy. Planting instructions Back-fill with soil mixed with peat and a suitable fertiliser. Boston Ivy. Virginia Creeper. A vigorous climber with bright green leaves. turning brilliant red to purple in autumn. Height 20m. Deciduous. Foliage colour Green. Hardy. Planting instructions Back-fill with soil mixed with peat and a suitable fertiliser. Blue Passion flower. A vigorous climber with rich green leaves and bowl-shaped white flowers with blue tips in summer followed by orange-yellow fruit. Height 10m. Flowers from June to August. Fruits from August Evergreen. Frost hardy. Passion flower. A vigorous climber with rich green leaves and bowl-shaped white flowers in summer followed by orange-yellow fruit. Height 10m. Flowers from June to August. Fruits from August Evergreen. . Shelter from cold drying winds. Planting instructions Back-fill with soil mixed with peat and a suitable fertiliser. Passion flower. 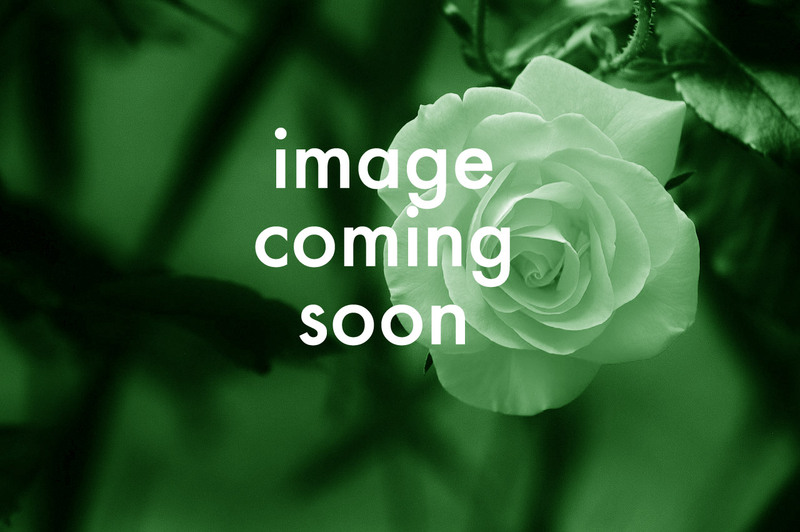 A vigorous climber with rich green leaves and bowl-shaped WHITE flowers with green anthers. Height 4m. Flowers from August to November. Evergreen. Foliage colour Green. Not hardy. Planting instructions Back-fill with soil mixed with peat and a suitable fertiliser. Firethorn . A new variety resistant to fire blight and scab with masses more berries. Vigorous bushy shrub with arching branches and glossy. bright green leaves. Clusters of white flowers are produced in early summer followed by bright red berries. Height 3m. Spread 3m. Potato Vine. A scrambling climber with dark semi evergreen green leaves. White flowers from summer to autumn. followed by black fruits. Height 6m. Flowers from June to September. Fruits from September Semi-Evgn. Prefers sunny south wall. Potato Vine. A scrambling climber with semi evergreen gold and green leaves. White flowers from summer to autumn. followed by black fruits. Height 6m. Flowers from June to September. Fruits from September Semi-Evgn. Prefers sunny south wall. A twining climber with glossy dark green leaves. margined and splashed with cream. often turning crimson in winter. Pure white flowers from mid to late summer. Pillar. Evergreen. Grape vine. vigorous vine that produces masses of black fruit in autumn. Plant in rich soil. in full sun either against a fence or wall. or in a greenhouse. Prune carefully in early years and thin grape bunches. Grape vine. vigorous vine that produces masses of edible sweet green fruit in late summer. Plant in rich soil. in full sun either against a fence or wall. or in a greenhouse. Prune carefully in early years and thin grape bunches. Grape vine. vigorous vine that produces masses of edible green fruit in late summer. Plant in rich soil. in full sun either against a fence or wall. or in a greenhouse. Prune carefully in early years and thin grape bunches. Prefers direct sun. Grape vine. vigorous vine that produces masses of edible black fruit in late summer. Plant in rich soil. in full sun either against a fence or wall. or in a greenhouse. Prune carefully in early years and thin grape bunches. Chinese Wisteria. A twining climber with pendent clusters of fragrant. lilac-blue pea-like flowers in late spring and early summer. Height 9m. .Sunny position.